Peda is a popular and traditional North Indian sweet made during festivals and occasions. The Mango Peda is a super simple recipe and makes for a great dessert to any festival, special occasion or parties. This peda is very popular during the summer months as the mangoes are in season. Dilute the milk powder with water. Grate the paneer and keep it. To a pan, and the mango pulp and and cook for 5 minutes. Add the grated paneer, sugar and mix thoroughly. Keep stirring until the sugar is dissolved. Add the saffron, diluted milk powder and cook for 10 minutes in medium flame. Keep stirring until the mixture is not sticking to the pan. Remove from flame and cool down. Add ghee to your palm, make small balls using the mixture. Decorate with pista and serve. 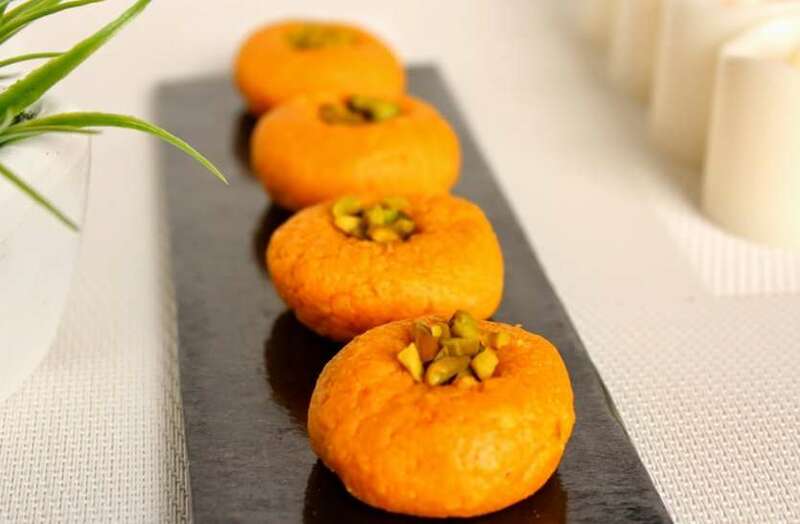 Feel free to comment or share your thoughts on this Mango Peda Recipe from Awesome Cuisine.